"But in terms of purity of flavor, not to mention charm, the small batch company Carmela Ice Cream, owned by Zachary Cox and Jessica Mortarotti, stands out amongst the impressive crowd. The husband and wife team has been selling their “garden-inspired” flavors at various farmer’s markets and specialty food shops around Los Angeles since 2007. Flavors like Strawberry Buttermilk and Brown Sugar Vanilla Bean taste classic with a twist. And their Chocolate Sea Salt cookie/ Mint Cacao Nib ice cream sandwich has to be one of the tastiest desserts in the city. 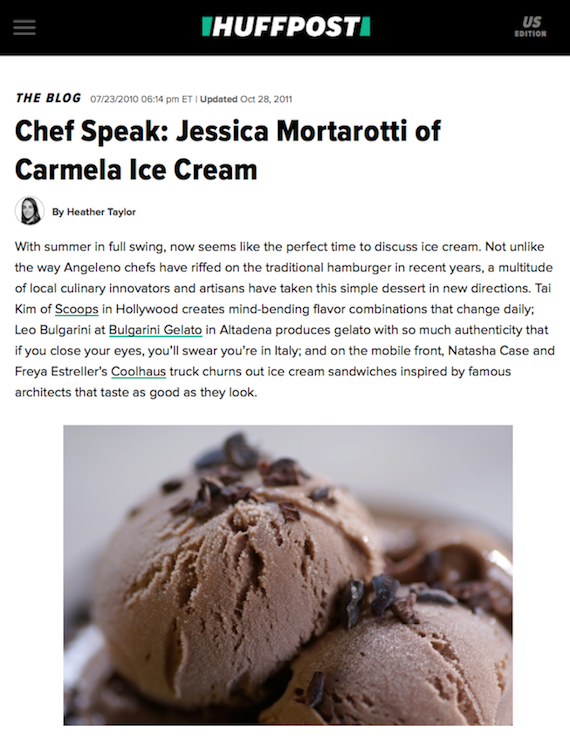 We chat with flavor developer Mortarotti about her culinary inspirations."